Binge and compulsive overeating is where someone feels compelled to eat when they are not hungry and who cannot stop when they have had enough. It affects more people than both anorexia and bulimia. We know that 1 in 2 people who seek help for their weight problem eats compulsively. Put another way, about 12 million people in the UK suffer from compulsive overeating to some extent. About 1 in 2 individuals trying to control their weight say that they have binged in the last month (not stating what is in the binge). 1 in 4 adults of both sexes trying to control their weight have Binge Eating Disorder as defined below. 6% individuals in the adult community as a whole describe themselves as “Compulsive Eaters” with 2% meeting the criteria for full blown Binge Eating Disorder. Another community sample cited by Fairburn 1992, in Oxford hire identified 15% of young women aged 16-24 reporting at least one binge in the previous 3 months. Experts and the general public differ in their understanding of compulsive overeating and binge eating disorder. Binge Eating Disorder is the name of an eating disorder in which a person is unable to prevent himself or herself from eating large amounts of food, often in a mindless state and in a short space of time; and the eating feels out of control. One difficulty in knowing whether you have Binge Eating Disorder is that no-one knows exactly what kind of eating constitutes a “binge”. One man’s binge may be just another man’s hearty meal. Compulsive Overeating is not the name of an eating disorder, it is a term that sufferers use to describe eating patterns that feel out of control and which can feel like an addiction to food that could make them gain weight. People who describe themselves as compulsive eaters feel that they cannot control their eating and thus they end up eating more than they need. As a result, compulsive overeaters usually struggle to control their weight. Compulsive overeaters have cravings that they cannot master, and may overeat small or large amounts of food, or just pick and nibble some of the time. So Binge Eating Disorder and compulsive overeating are much the same thing and the differences between them do not really matter. Because compulsive overeaters feel that they cannot control their intake of food, they are likely to describe themselves as lacking in “willpower” and they would usually say that they are eating for comfort rather than for genuine physical need. I cannot control myself. I’ll open the fridge and eat. No matter what time of day, even if I’ve just finished breakfast or dinner. I’ll still search for food. I’m not necessarily hungry, I’m just addicted – its like a drug. The more I have the more I want. I eat it so quick, like there’s no tomorrow. And it’s always in secret. I even bring food to bed, and in the morning I put the wrappers in an outside dustbin so no-one knows what I’ve eaten. If I know that my family and husband are going out, I’ll make up an excuse to stay home, that way I can eat and eat and eat. I’m so disgusted and ashamed of myself. I hate myself for doing it. I know it’s wrong while I am doing it but I will carry on. That is what I can’t understand, while I’m bingeing. I know what I’m doing but I don’t stop. Food is ruling my life. I just wish I could take it or leave it. But it’s never enough. I eat properly in front of other people and eat masses when I get home and on-one can see me. I go backwards and forwards to the fridge looking for something to satisfy me and nothing seems to. I start a diet on Mondays and by 11 o clock I am in the biscuit tin, saying here I go again. I am fine for a while then I say just one bit of chocolate won’t hurt then it’s like I’ve blown it so who cares and I will start again tomorrow. I eat in the car before I get home stuffing my face and if people knew what I was doing I couldn’t bear it. I get this craving in my head and my mouth for chocolate and I can[t relax until I have had it. This affects men and women of all ages, unlike the other eating disorders which are heavily biased toward females. However, women are more likely to ask for help and this is probably because women are more concerned about the effects of overeating on their appearance. Some of these observations are useful in helping the expert to treat the condition and help someone to regain an enjoyable relationship with food. Comfort eating – to manage difficult and troublesome feelings? A sign of a deeper emotional problem? Many writers have blamed dieting for provoking compulsive eating problems. They claim that dieting makes people deprived and depressed – and thus increases the desire for food which they are not supposed to eat. The solution would therefore be to forgo dieting, stop worrying about one’s weight, eat to excess all the foods on the forbidden list and eating would then settle down. Formal studies of dieting have shown that dieting provokes cravings, impulsive eating (you must eat something just because it is there), low mood, and the inability to stop eating when satiated. These symptoms persist well after someone has stopped dieting and even if they are eating normally. But not all people who diet become compulsive overeaters so obviously something else must be true those who develop a very unhappy relationship with food. Not all people who ditch their diets regain control of their eating. Also, while the importance of prior and ongoing dieting cannot be ignored, other personal influences will bear on whether one dieter will develop a problem and the other will not. Food can feel like an addiction, a desire to eat something that is forbidden; that will make you feel better in the short term even though it may harm your health and your weight in the long term. Both addicts and overeaters refer to preoccupation with the “substance”, the sense of craving for particular foods, giving in, and not being able to stop when you have had a reasonable amount. Both addicts and overeaters talk of repeated attempts to give up “tomorrow”. Like the traditional addictions to alcohol and drugs, compulsive eating can interfere with your life and cost a great deal of money and remorse. Food like ice cream, chocolate, biscuits and French fries which are rich in fats or sugars affect the same regions of the brain which are stimulated by drugs, cigarettes and alcohol. Trying to stop eating these foods can lead to withdrawal symptoms. There is a popular theory that certain people are “addicted” to refined foods and sugar and must abstain from them. But when such persons are given white flour and sugar in blind trials, they do not show increases in cravings or loss of control. This suggests that the addictive effects of these substances are largely psychological. So, addictions and compulsive overeating share some features but at the NCFED we firmly believe that it isn’t helpful to think of compulsive eating as the same as, for example, alcoholism because we can live without alcohol but we cannot live without food. We do not like to think of people as addicts and we can treat compulsive eating effectively. Much of what we do is habit and some habits can be very stuck. Where food is concerned some of our habits track right back to our childhood. Food habits are predictable, we all tend to eat what we like and we eat more at the weekend than we do at the start of a week. Even our indulgences are a habit. None of us change our habits very easily. Treating compulsive overeating must involve treating that part of the disorder which is a habit. But this is one aspect of the problem, even if it is a very important part. People who try to control their weight but fail to do so often say that they lack willpower. They may try many different kinds of diets, or resort to slimming pills or other more dangerous practices to control their weight but nothing works in the end. Some people say that they have just given up trying to lose weight but this does not change their damaging relationship with food. 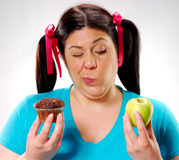 Compulsive overeaters do not have less willpower than people who eat normally and healthfully. They do however have more cravings for food and stronger cravings. It follows that to treat compulsive eating means getting rid of the cravings and then it will be far easier to stay in control of food and weight. We all eat to change our emotional state to some extent and we all learn to do this early in life. We might reward ourselves with food at times, eat to share a social occasion, nibble in response to anxiety, eat to fill up the time when we are bored, or have a special meal to calm ourselves down when we have had a bad day. However research clearly shows that people who eat compulsively are often triggered by mood changes, whether the moods are good or bad. Feelings such as anger, guilt, sadness and anxiety can often trigger episodes of overeating. What does this tell us about the inner world of someone who eats compulsively? Psychologists believe that comfort eating is not so much a way to feel better as it is a way to avoid or manage emotions that might lead to shame or emotional discomfort. The events which have given rise to this situation are varied. Treatment of the overeating involves helping people to manage these emotions without needing to turn to food instead. It may also involve providing a person with a new range of skills dealing more effectively and assertively with other people. People with binge or compulsive overeating problems are very stressed. Stress can come from the disorder itself; after all, overeating and blaming yourself for your behavior is very stressful. People are very ashamed of their behaviour and try to hide it from others. And this may lead to more overeating. Sometimes life is very stressful and the sufferer has learned that overeating provides a short term remedy for feeling overwhelmed, also offering a way of coping with the ups and downs of life. Sometimes the stress comes from within. If you suffer from perfectionism, and are always trying to perform to your own high standards, if you never feel quite good enough, overeating can be both a way of consoling yourself for the pressure or even beating yourself up for not being as effective as you would like. Learning how to manage stress is an important part of treatment but the therapist must first discover where the stress comes from and how to address its roots. People who binge eat generally hate the way they look and have poor body image. They always feel that they should be eating less even if they can’t always do something about it. Horrible feelings of fatness means that even when they do eat they can’t enjoy it properly. Poor body image has many effects, from avoiding social situations, not taking care of yourself and not being able to enjoy a holiday. Compulsive eaters believe themselves to be fat even when they are not and they feel instantly fat after eating foods which are considered forbidden. The consequence of feeling fat and feeling terrified of weight gain leads to constant attempts to compensate for taking in unwanted calories by dieting, starving, taking slimming pills and so on. Sadly these strategies usually make the eating problem even worse. There are some overeaters who feel so hopeless about their weight that they give up trying to control it. I’m fat anyway, so why bother, they might say as they reach for another piece of cake. Helping a person think more kindly of their body is an important part of treatment and will have knock on effects on self esteem. Treating body image helps a person be kind to themselves with food and predicts recovery from the eating disorder. Many people believe that compulsive or binge eating is a sign of deeper psychological difficulties. There is little evidence that this is the case, although severely overweight binge eaters have a greater lifetime risk of depression, alcohol abuse and anxiety disorders. Compulsive overeaters who develop harmful weight control practices such as vomiting or laxatives have a greater likelihood of traumatic events in their early childhood such as physical or sexual abuse, or even neglect. It is only necessary in treatment to go back and resolve these issues if it is felt that the person is still being affected by these events. The first part of treatment is a very good assessment with a professional who understands eating disorders and who will identify what kind of compulsive eating is going on from the checklist above. A full eating history will allow the therapist to identify the events and challenges that predisposed you to the problem. The assessment will also pinpoint what is keeping you stuck right now. Treatment will then be directed to both the physical and emotional factors which are maintaining the unhelpful relationship with food, depending on what has emerged at the assessment. Antidepressant drugs do not work well for binge or compulsive overeating and what happens when you stop taking the tablets. This is why we do not recommend drug treatment for binge eating. If someone has other problems such as phobia or a severe depression, then drugs may be useful to help the eating therapy to work more effectively. We suggest careful consideration before doctors reach for the prescription pad and in our experience drugs are needed for very few people. Appetite suppressants also do not work in the long run for compulsive overeaters and can often make the problems worse in the long run. Good therapy will give control back where it is most needed – from within.